The April Play Jazz! workshop is special because it is part of the Gateshead International Jazz Festival. 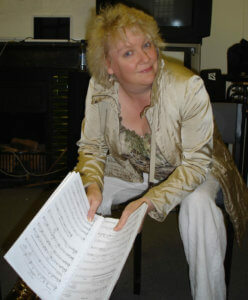 It will be facilitated by guest tutor Issie Barratt, whose groundbreaking Interchange Dectet – featuring new compositions by female jazz musicians – will be playing at the festival. Issie is an internationally active composer, arranger, conductor, baritone player, record producer and educator who has performed at many worldwide leading concert halls, jazz clubs and festivals. She was founding head of Jazz at TrinityLaban and is the founding Artistic Director of National Youth Jazz Collective and Fuzzy Moon Records. In the Play Jazz! workshop she will be ‘Telling Tales’ (literally and musically) about creative women in jazz, past and present, including Annie Whitehead, Barbara Dennelein, Billie Holiday, Carla Bley, Emily Remier and Tori Freestone. Each four-hour workshop costs £20 (or £18 for Jazz.Coop members). Ticket sales are handled by the Sage and there’s a booking fee for online and telephone sales (but not if you pay cash at the ticket office).